Dr. Christian Brenes. Photo by Phil Jones. Luckily for his patients, Brenes followed that passion. 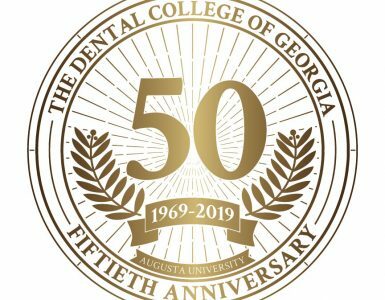 Brenes, who earned his dental degree in his native Costa Rica and a master’s degree in prosthodontics from the University of North Carolina at Chapel Hill, joined the DCG faculty in 2016 to continue his quest of transforming people’s lives through their smiles. When Brenes arrived, he was thrilled to find an environment that continually encourages its faculty to push the envelope. Brenes wasted no time making his mark in prosthodontics, which focuses on the design, manufacture and fitting of artificial replacements for teeth and other parts of the mouth. This is the discipline, he noted, that can transform devastating damage — for instance, missing or misshapen teeth caused by factors such as congenital birth defects, trauma or decay — into dazzling and natural-looking smiles. 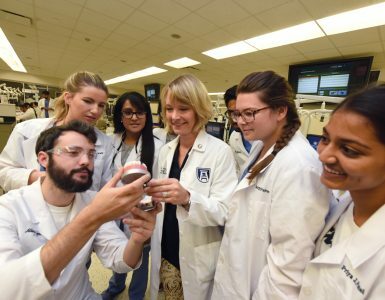 Digital innovations sound more like science fiction than science: entering commands into a computer, then having crowns, bridges and other fully customized dental restorations pop out of a three-dimensional printer or a milling machine. Several industries, including space aeronautics, have already fully embraced 3-D technology, and dentistry is catching up fast, Brenes says. Challenges have included perfecting the biocompatible materials used as raw material, as well as creating protocols for integrating software with hardware. And even now, the materials produced by 3-D printers are limited largely to provisional restorations. But a fully digitized process is rapidly evolving. DCG already houses several milling machines and 3-D printers and is preparing to add more. 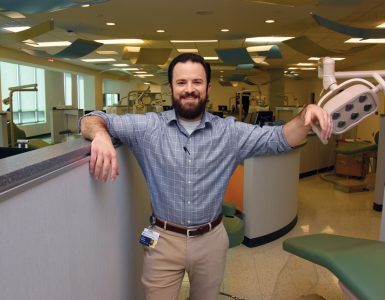 “Our dental school has been really supportive, and we already have many tools on hand,” Brenes says. • 3-D printing is the next phase in the evolution of computer-assisted design and computer-assisted manufacturing (CAD-CAM) or using software to control machines to manufacture work pieces. Three-D printing describes the additive manufacturing processes that build three-dimensional structures by depositing layers of material on top of each other until the final structure is achieved. • The cost, ease of use and versatility of 3-D printers have improved greatly over the years. 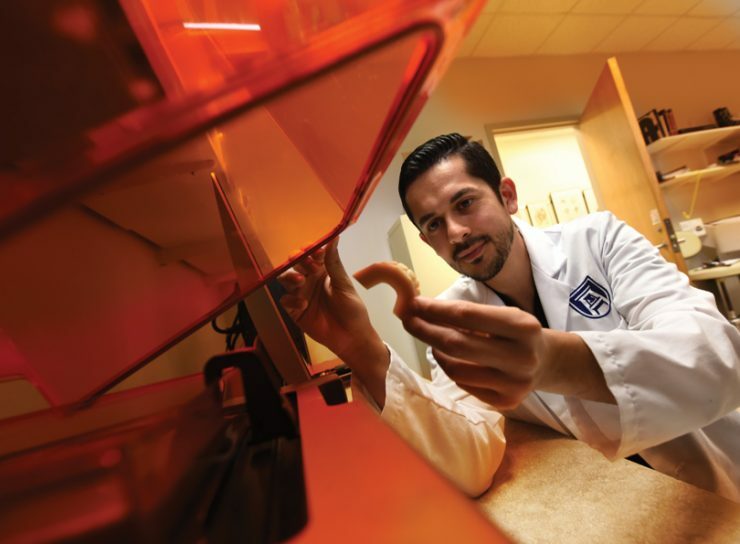 When first introduced to dental labs, 3-D printers were components used in select laboratories only for provisional restorations, but they are now booming not only in dental laboratories but in dental offices. The final product is now the goal. The future: printing teeth from ceramic materials, matching the color and shape of natural teeth. • It was traditionally challenging to fully integrate digital tools such as 3-D printers into the dental workflow, but that’s changing. The market is catching up with the technology, and offices are increasingly housing state-of-the-art printers and materials. • Many dental offices and labs are already partially digital (using intraoral scanners, for instance), so the evolution is well underway. For best results, the software must be adjusted and fine-tuned to the particular lab’s/office’s needs. Also, most digital workflows require post-processing (light curing, cleaning, casting, articulation, color correction, etc. ), so skilled dental laboratory technicians are still vital. • New materials are being quickly introduced, including biocompatible materials for areas including digital orthodontics, digital dentures, digital endodontics and oral and maxillofacial surgery.